It is 1870. Georgia, the last outcast Confederate state, has been readmitted to the Union, the 15th Amendment giving freemen the right to vote has been passed. In Boston, Edward Moody is a photographer. He’s also a con artist. 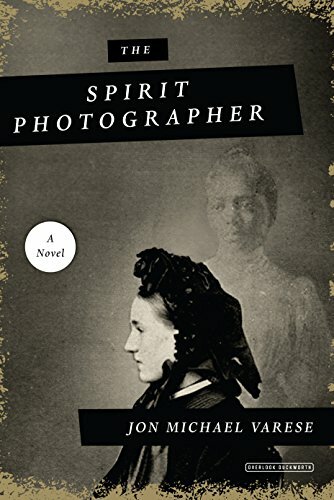 In an era when spiritualism is coming into vogue and the period of loss after the war between the states sends grieving widows and parents in search of reassurance of an afterlife, his photographs, showing the spirits of lost loved ones, has brought him fame and a good deal of fortune. He will one day remember and realize the truth of those words. His life changes the day the wife of Senator James Garrett convinces her husband to sit with her for a portrait in the hope of contacting their son who died as a child. It isn’t William Jeffrey’s spirit caught on the photographer’s plate, however, but that of a young woman Edward knew long ago: Isabelle, a runaway slave. Edward had met her, fallen in love, and then she disappeared. If Isabelle’s spirit is in the photograph, she must be dead, but why has her ghost waited this long to return? Why does it appear in the photograph of a Yankee senator? When Moody finds himself accused of fraud and prosecuted by Garrett, he becomes a fugitive from justice. Along with Joseph Winter, a man who also knew and loved Isabelle, he’s determined to discover how her disappearance relates to the senator and why Garrett’s so determined to put him behind bars. Moody’s journey will take him from Boston to the bayous of Louisiana where he’ll discover Isabelle’s fate, and its cause, and find a living breathing testimony of her life. After that, he’ll return to Boston, bringing justice for everyone involved. Interspersed with news articles from a Boston paper following Moody’s trial, there’s a great deal of historical fact in this story, giving the reader the choice of viewing the tale as a background to history or simply a very imaginative mystery novel. Either way, readers will have an enjoyable journey through the turmoil of the world following the cessation of the war and the devastation of Reconstruction as seen through northern eyes. While Moody is at first portrayed as a con artist, pure and simple, after he develops the plate on which Isabelle’s spirit picture is found, he changes to a much more sympathetic character with only one goal in mind: to discover the fate of the woman he loved. A different kind of detective story, The Spirit Photographer is an American gothic novel set in a time of post-war turmoil. Jon Michael Varese has written a very entertaining and haunting story of historical suspense.